A day after Yahoo’s surprise appointment of Marissa Mayer as its new CEO, the struggling Web portal reported second-quarter results underscoring the challenge she faces in restoring robust growth to the company. Yahoo posted net revenue of $1.08 billion in the quarter -- flat from a year ago, and slightly below Wall Street analysts’ expectation of $1.1 billion. Net earnings of 27 cents per share, excluding certain items, were up 47% from 18 cents a year ago, easily beating the consensus estimate of 23 cents a share. The flat revenue growth in the second quarter showed Yahoo wasn’t able to build on the slight 1% gain of the first quarter -- the first increase after five straight quarters of declines of 10% or more. Display ad revenue, minus traffic acquisition costs, rose a modest 1% from a year ago to $473 million. Search revenue increased 4% to $385 million. Other revenue fell 7% in the second quarter. Anyone expecting Mayer to lay out an ambitious plan for Yahoo’s turnaround during the analyst conference call Tuesday was disappointed, since she did not participate in the session -- her first day in the new job. Yahoo’s announcement of her hiring Monday afternoon caught many off guard, with interim CEO Ross Levinsohn expected to be made chief executive on a permanent basis. Nevertheless, "everyone at Yahoo is incredibly energized today and looking forward to work with our new CEO,” said Yahoo CFO Tim Morse during the conference call. If nothing else, the move has already created a new buzz around Yahoo amid speculation about whether the former Google star can revitalize the drifting Internet giant. Wall Street isn’t so sure. While acknowledging Mayer’s achievements at Google, analysts covering Yahoo are not quite ready to anoint her the company’s savior. Despite her strengths in areas such as product design and user experience, they point to her lack of CEO experience and limited background in areas critical to Yahoo’s business like brand advertising sales and media. “Given Yahoo’s history, we don’t give it the benefit of the doubt and will take a wait and see approach as Ms. Mayer lays out a vision and then attempts to execute against it,” wrote Ben Schachter, an analyst with Macquarie Securities, in a research note Tuesday. The company’s second-quarter performance did little to ease doubts about Yahoo’s present course. While display ad revenue crossed into “positive territory” in the Americas, Morse said it fell 7% in Europe, the Middle East and Africa because of the weak global economy. He also noted that display pricing was a bit softer than expected in the quarter. On the search side, Yahoo saw a slight gain in search query volume globally, but the company is still struggling to improve revenue-per-search (RPS) through its search alliance with Microsoft. Morse emphasized that Yahoo continues to benefit from the RPS guarantee Microsoft provides under its deal while the companies work on improving search performance. In the U.S., Yahoo’s share of the explicit core search market in June fell to 13% from 13% in May, while Bing’s share edged up to 15.6%, and Google’s to 66.8%, according to comScore. JP Morgan analyst Mark Mahaney pointed out that Yahoo’s share has fallen to its lowest point since the firm began tracking the data. Among other developments, analysts have also been closely tracking the status of Yahoo’s proposed deal to sell its 40% stake in Chinese e-commerce company Alibaba. Morse said the transaction, first announced in May, is proceeding well and should close before the six months envisioned. After taxes, the deal is expected to net $4 billion for Yahoo. 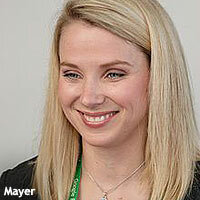 Yahoo did not provide any third-quarter outlook in light of Mayer just joining Yahoo. “We believe it's best to give our new CEO time to get acclimated to Yahoo before providing any future guidance,’ said Morse. Analysts had estimated the company to earn 25 cents a share on sales of $1.1 billion for the quarter. Yahoo shares closed Tuesday down slightly, at $15.60. 1 comment about "Yahoo Revenue Flat In Q2, Challenge Awaits Mayer ". Walter Sabo from SABO media, July 18, 2012 at 7:50 a.m.
hysterical. another engineer running a content company. fred wilson declaring yahoo dead in march and then an engineer gets the job and he's all excited. hysterical. these people haven't had to meet a payroll from their own savings get back to me when they do that.